Dreams of a sixth World Cup title for Brazil were dashed yesterday as a completely dominant Germany humiliated the men in yellow. 7-1 is not only Brazil’s worst defeat ever, but also the second worst in the history of World Cups, only trumped by Sweden’s 8-0 against Cuba in the quarterfinals of 1938. 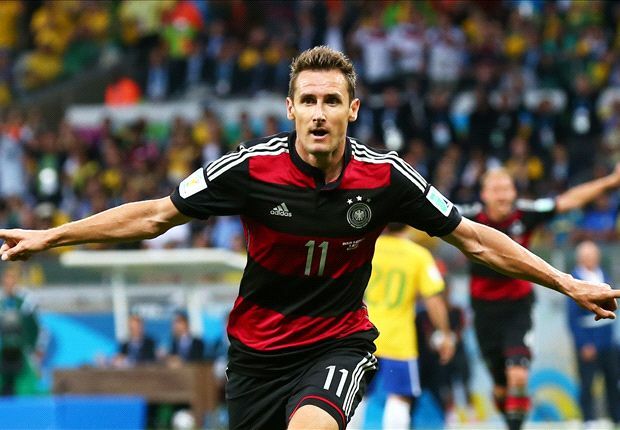 Muller opened up the scorecard for Germany in the tenth minute, then Miroslav Klose drilled home, becoming World Cup top scorer of all times with his 16 braces. What then followed at the Mineirão stadium was an utter disgrace: Brazil’s defence suffered a complete meltdown, allowing the German side another three goals in six minutes, making the score 5-0 with 28 minutes on the clock. We saw Germany cruise through the remainder of the game, adding two additional braces in the second half, before Oscar defined the end result in the dying minutes. There are explanations to the seemingly inexplicable. Emotional aspects come into the mix, the pressure on the squad, expectations. The collective blow of losing Neymar and the whole “play for him” sentimentalism that followed. Motivation and emotion, the us-against-the-world, defined as the “Família Scolari” approach – has worked on previous occasions. This time, it backfired. Now, would yesterday have played out much differently with Neymar and Thiago Silva on the pitch? Not likely. 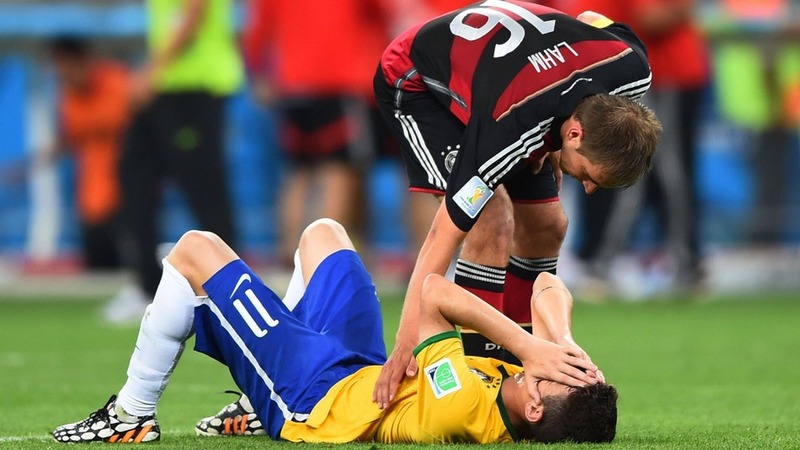 Brazil lost because of hubris, believing it could take Germany on as equals. The German squad has been carefully crafted for years, with players moulded to fit like pieces in a machine. In comparison, the Brazilian “little canary” is young and unexperienced as a group. Unexperienced, chiefly because of the many different players that have been tested and discarded in the last few years. Scolari’s relaxed attitude to training hasn’t helped: Brazil played Chile on a Friday, the players only going back to train on the Tuesday. However, tactical errors must be considered the primary reason for yesterday’s disaster. As during earlier games, Brazil’s lack of a midfield was obvious. Against Chile and Colombia, Brazil suffered but pulled through. Against Germany, not strengthening the midfield equalled suicide. Penetrating Brazil’s defence with ease, it looked like the Germans were on a training session. Who’s to blame? Primarily coach Scolari. But we need to look further. Brazilian football has stagnated. Internally, externally. On and off the pitch. And this while maintaining an absurdly arrogant attitude. It’s time for Brazilian football to rethink itself, to reframe glories and values from the past into a modern context, a globalized perspective, humbly learning from others and implementing profound changes. At club level, in regard to legislation, financial transparency, the Federation, relationship with sponsors (in particular Rede Globo), match hours… The list could go on and on. Change must also happen at player level, but not through “implementing”: something is lacking in terms of maturity and responsibility on an individual level. Something has been lost (or were never present) behind all the hairdos, gang style signs, instagraming, silly dance moves and everything else taking the focus away from football. Watching Brazilian TV these last few weeks, you wouldn’t believe the number of commercials featuring Scolari and Brazilian key players. Neither would you believe the easy access selected Brazilian entertainment TV has had to players and staff throughout the tournament. Brazil needs to man up. Learn when it’s time for fun and when it’s not. Give and demand respect. In so many aspects; football being only one of them. Brazil takes on either the Netherlands or Argentina in Saturday’s bronze match in Brasilia. In case of an all-out South America clash, FIFA has already signalled it will suspend the selling of alcoholic beverage at the Mané Garrincha stadium. Wisely so, if you ask me. The World Cup, as a tournament, is a success. The path leading up to it has been a tragedy of wasted money and opportunities. As for the legacy? For Brazil? Let me get back to you on that one. Very good article Kristian. A complete disaster yesterday, led by who used to be one of the greatest idols of our Palmeiras. I wasn’t really sure about his share of responsibility in relegating us to Série B (I blamed almost everything on Tirone and Frizzo), but it is now clear that he had a heavy hand on it. I’m skeptical as to whether the changes you have summarized in the list above will ever happen or not. Football in Brazil works with such archaic and corrupt structures that I believe only State intervention could help, with a complete revamp of laws and regulation. But, as Romário pointed out today, this is clearly not a priority for our federal government. Too bad for us, football fans, and I guess to the world as well, as we all witness the great Brazilian school of football players, together with several of our traditional teams, languish. Marco, thank you for your kind words and insightful comments. I must confess I also freed Scolari from most of what went wrong in 2012, and just like you, have made revisions to my views, not based on yesterday only but observing the man and listening to people who have been closer to him. Love and hate. Nothing is simple when it comes to Scolari. And he feeds a lot into that himself. Thanks for dropping by, volte sempre! As you alluded to, I feel that Scolari’s team relied much too heavily on Neymar in attack. When he went down, the writing was on the wall. I think Scolari’s biggest shortcoming as coach of Brazil was that, as you said, there was no continuity in his player choices and tactics, and the strategy in attack seemed to be to give the ball to Neymar and cross his fingers. He had Hernanes on the bench, and he wouldn’t call up Kaká, players who are good at regulating play and helping maintain possession, while possessing attacking flair. Not that throwing them into this team would have made much of a difference, but the lack of preparation and any kind of real plan, demonstrated by the total collapse without Thiago Silva and Neymar, is astounding and embarrassing. You can’t wing it and expect to win the World Cup. I don’t think Argentina has played very well either, since everything has to revolve around everyone’s favourite little gnome, so here’s hoping for a German triumph in the final, even though it means they’ll be equal to Italy again with 4 World Cups. I agree, Davide: Argentina hasn’t been playing vey well. Actually, no team has presented spectacular football, the Germans coming closest. But they have, at least, been very consistent. I believe they will add their fourth star on Sunday. Cheers!